Funded by a public and private partnership, the $103 million Rio Tinto Center is provided with multiple features that embrace both traditional and new media techniques. The cost of admission to experience the museum’s renaissance is $9 for an adult, well below admissions costs charged by other major museums across the United States. The Natural History Museum of Los Angeles County has recently raised its adult-admission cost by 30 per cent to $12, while 25 per cent increases at both the Museum of Modern Art and the Metropolitan Museum of Art in New York have increased their adult-admission rates to an eyebrow-raising $25. For more than four decades, the Natural History Museum of Utah has connected Utah residents and tourists with the natural wonders and native cultures that define Utah. As an active research institution with a growing collection of more than 1.2 million specimens and objects, the museum is a major cultural and educational asset for the state and for scholars in general. “We feel Utah residents will be very proud of our new home, which is the product of the work of literally every community in the state and experts from around the world,” says Sarah George, executive director of The Natural History Museum of Utah. The new, 163,000-square-foot Rio Tinto Center is clad in 42,000 square feet of copper and occupies a prominent place at the edge of Salt Lake City and the University of Utah. The facility is designed to blend into the foothills of the Rocky Mountains, the angles of the roof rising and falling with the slope of the foothills in the background. Designed by Todd Schliemann of Ennead Architects, the museum’s new home overlooks the Salt Lake Valley from its 17-acre site. Leading the project team, in addition to Schliemann, are Don Weinreich of Ennead Architects, as well as David Brems and John Branson of Salt Lake City ’s Gillies Stransky Brems Smith Architects. Inspired by the region’s natural landscape of rock, soil, minerals and vegetation, the Rio Tinto Center rests on a series of terraces which step up the hill and lie along the contours of the site with minimal disruption to the adjacent natural landscape. The new building is located above the shoreline of ancient Lake Bonneville, with the Bonneville Shoreline Trail passing through the property, and provides excellent views of the Wasatch Front. 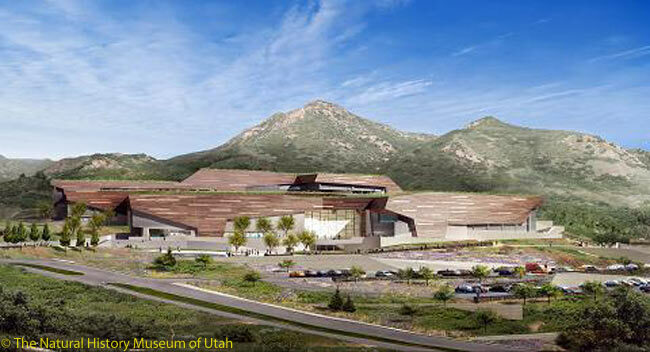 The design of the Natural History Museum of Utah aims to be a model for responsible and environmentally sensitive development. By incorporating the use of recycled materials, local resources, photovoltaic energy, radiant cooling and the implementation of an extensive storm water catchment and management system, the Natural History Museum of Utah is seeking LEED Gold certification, which would make it one of only 18 buildings in Salt Lake City with that distinction. Inside, the building is divided by a 60-foot-high central public space, The Canyon, which is the centerpiece of the Museum’s interior. One wing of the new museum contains spaces dedicated to the objective understanding of our world – research laboratories, conservation labs, collection storage and administration. Its other wing houses public spaces with exhibitions dedicated to the subjective or interpretive aspects of our world, so that visitors can explore the delicate balance of life on earth and its natural history. These areas are galleries and spaces in which to present, interpret and study the Museum’s extraordinary collection of artifacts and exhibits. 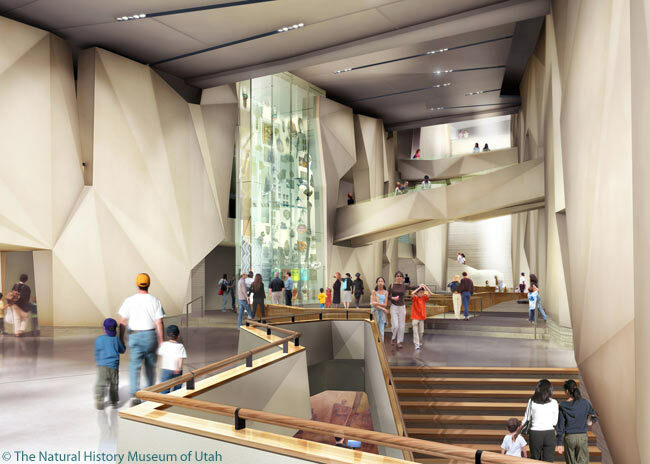 The Natural History Museum of Utah houses the state’s collections in new exhibitions designed by Ralph Appelbaum Associates (RAA) and offers more than 41,300 square feet of gallery and education space, including The Canyon where some Museum theater pieces will be performed. The museum’s collections form the basis for all of the museum’s educational functions, from public exhibits and programming to scholarly research and publication. According to the Natural History Museum of Utah, its systematic collections in the fields of earth sciences, biology and anthropology rank among the largest and most comprehensive in the western United States. While emphasizing the Great Basin and Colorado Plateau, they also include material from throughout the world. Ongoing development of these collections is directed toward strengthening their comprehensive regional coverage and increasing their significance and accessibility to all communities. The new museum’s exhibitions tap its vast collections in new ways and aim to put more of Utah ‘s treasures on display. This is done in a set of interdisciplinary galleries which explore the diverse ways in which we understand our world. The selection of objects necessitated a careful analysis of the museum’s existing collections – some of which had never been seen by the public – and a convergence of traditional perspectives to tell a more nuanced story. Nine dedicated, thematic exhibition galleries explore the Sky, Native Voices, Life, Land, First Peoples, Lake (Great Salt Lake), Past Worlds, Our Backyard and Utah’s Futures. Each gallery draws from several scientific disciplines and collections, as well as from the humanities. The Rio Tinto Center will offer several free areas in the Museum building: The Canyon, boasting expansive views of the valley; the Museum Store; and the Museum Café, with indoor/outdoor seating and access to the University of Utah ’s Wi-Fi network. To find hotel deals in Salt Lake City, click here.